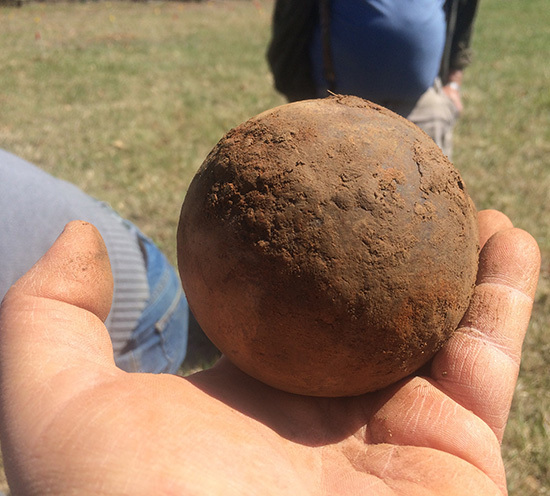 6-pounder solid shot recovered from Pea Ridge National Military Park. Pea Ridge National Military Park lies just east of Bentonville in northwest Arkansas, and presents the March, 1862, battle to thousands of annual visitors from around the world. It marks a pivotal moment in the American Civil War, as the U.S. victory there not only secured the Ozarks in federal hands, it had a profound influence on the war nationally, helping to usher in a Union victory. Pea Ridge also has the distinction within archeology of being one of the most thoroughly researched battle sites in the world. Archeological research on battlefields is a relatively new specialization, but grows year-by-year as archeologists perfect skills and try new methods. Pea Ridge is one of the places where those skills and methods get honed, and the park as a result has had more fieldwork done on it than nearly any other battlefield. Over 600 acres have been studied, and thousands of battle-related artifacts have been found. These include bullets, cannonball fragments, soldiers’ equipment, personal effects, and discarded gun parts. The fieldwork at Pea Ridge has been done by both the Arkansas Archeological Survey (ARAS) and the National Park Service (particularly the Midwest Archeological Center). That work continues today, as ARAS is in the middle of a collaborative agreement with NPS that fills in important knowledge gaps about the park and the battlefield through both open-block excavation and systematic geophysical surveys (including metal detector surveys) of park lands. What does battlefield archeology give us? It tells us where soldiers were during the battle, and can even be used to track the movements of units across the battlefield. This helps the National Park Service present the battle accurately to the public, which is ultimately doing honor to the men who fought there. It also can tell us things we didn’t know about the battle in the first place, like different kinds of weapons used or the presence or movement of units we didn’t know were there (no, it’s not all in the history books). It also gives us tangible links to individual soldiers, most of whom did not leave accounts of their experience and who too often fade into the mass of moving regiments. Each bullet is a unique bridge to both the man who fired it and the man it was aimed at. Every cannonball fragment was part of an explosion that thundered in the ears of men and horses, provoking terror and exhilaration. Buttons found on the battlefield may have been left by wounded soldiers who would tear at their clothes to see where they were hit and what their chances of survival were. Artifacts provide those links very powerfully, and recovering them in context through systematic fieldwork gives us a very rich picture of the battle.